Stephen F. Austin University Press, 9781936205844, 300pp. Charlie Sweetwater returns to his hometown to visit his brother but arrives to find he is a no-show: The Coast Guard has discovered Johnny's shrimp boat drifting abandoned in the Gulf. Is it "death by misadventure" as the authorities presume, or something more sinister? Meanwhile, Fulton Harbor, where Charlie's family have docked their shrimp boats for generations, has changed--and not for the better. Hard-working Vietnamese fishermen are under the thumb of Col. Nguyen Ngoc Bao, a ruthless exiled gangster who aims to recreate his criminal enterprise in a New World setting. Confronting Bao and his thugs are Charlie and a mismatched group of good guys (and gals): a fast-and-loose Cajun hustler, a salty cast of "Third Coast" barroom regulars, a handful of courageous Vietnamese emigres, a menacing ex-convict, and a misplaced Texas Ranger who discovers a slice of the Lone Star State that the cowboy movies of his boyhood never prepared him for. Along the way Charlie finds himself falling for his brother's girlfriend, whose zealous desire to see justice served tests his own limits for loyalty and commitment. Unlikely heroes arise from improbable circumstances, and the denizens of the small seaside community find their fortunes and fates ebbing and flowing like the tidal flux of the ocean itself. Miles Arceneaux is the nom de plume of Texas-based writers Brent Douglass, John T. Davis and James R. Dennis, who began the novel as a lark--a daisy-chain manuscript with participants writing chapters in turn. Critical encouragement, a Best Mystery Manuscript award, and friends' enthusiasm for the book combined to encourage the trio to finish it. 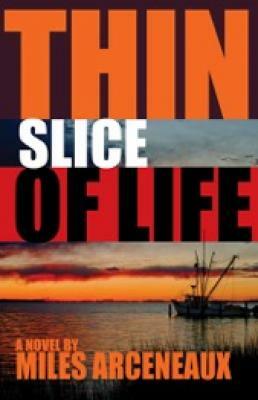 Miles is currently working on the third novel in the series introduced by Thin Slice of Life.